I would like to take a moment to address the Orlando tragedy. As an elected official, many people turn to us in times of crisis to be a voice of reason, a voice of understanding and a voice of hope. In this particular instance especially, I struggle to find the right words to do just that. It seems that when we celebrate taking 2 steps forward, in an instant, we take 49 steps back. Regardless of your political or religious beliefs, Sunday’s events were a human tragedy. A hate crime against 49 human lives. 49 American lives were lost and 53 more hang in the balance. Join me and everyone across the nation in recognizing that hate exists. Hate is real. And hate is something that we all must band together to overcome so that those who don’t respect the value of your life, my life and the 49 lives lost to yet another occurrence of senseless violence are given a new path to acceptance and love. Here I am speaking at the Capitol vigil, which was organized by Robin McHaelen from True Colors and Saud Anwar, founder of the American Muslim Peace Initiative and former South Windsor mayor and current councilman. 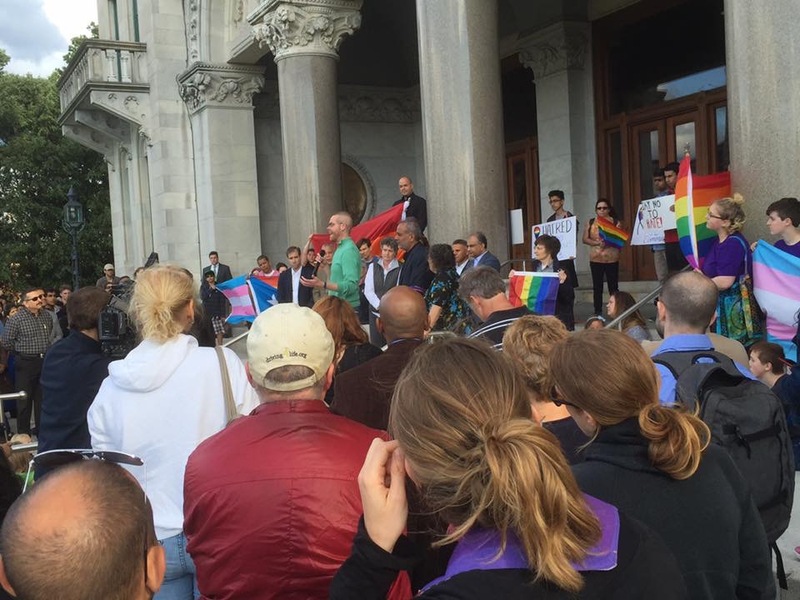 Also in attendance were representatives from CT Aids and the Gay and Lesbian Health Collective. 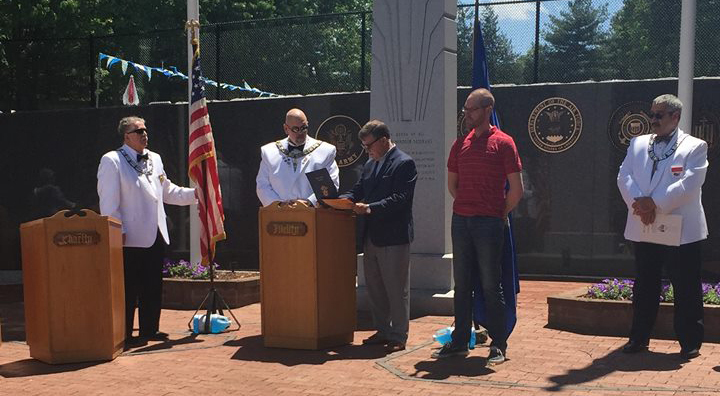 On Sunday, the first day of Flag Week, I attended the Flag Day ceremony at South Windsor Veterans Memorial Park sponsored by the Windsor Elks. This year marks the 100th anniversary of Flag Day and I was honored to be part of a ceremony that aims to appreciate everything the American flag represents. To learn more about the history of the flag, click here. Monday night, I attended East Hartford High School's 120th commencement! Congratulations to the 379 graduates on this major milestone! Fun facts about the class of 2016: 33% will start the fall at a four year school, 52% will start the fall at a two year school, 7% will head to a vocational school, 4% will enter the workforce and the remaining 4% will go on to serve our country. I also want to congratulate Principal Ryan and Assistant Principal Anderson for organizing a graduation our future leaders won't ever forget! 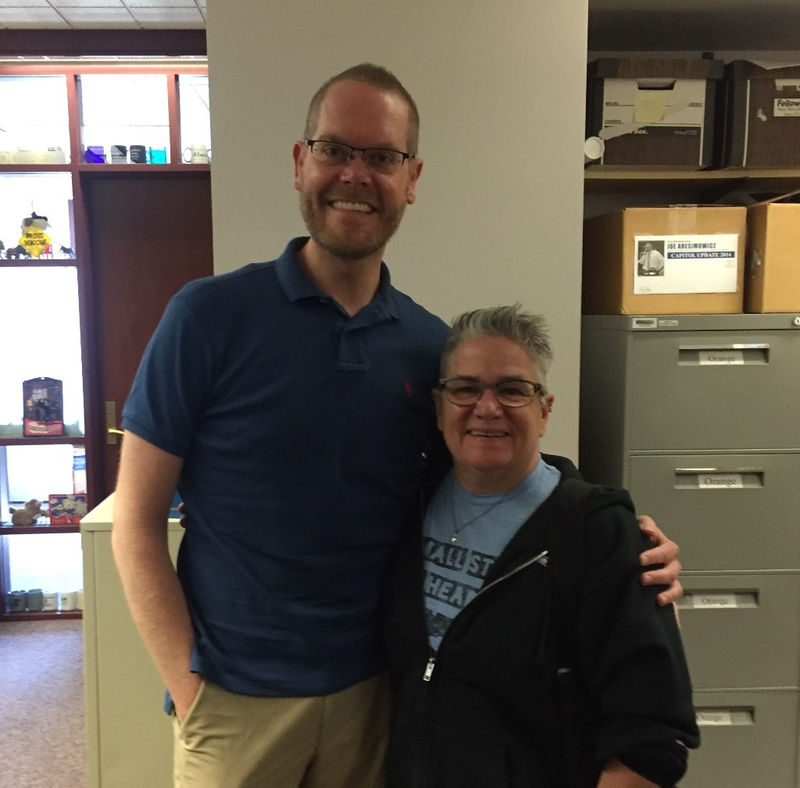 The following day, I met with Shawn Lang from Aids CT (ACT) to discuss some of the various services the coalition offers. I applaud ACT for improving the lives of people impacted by HIV through services such as housing support, financial assistance, counseling, and testing. To view a complete list of the services offered, click here. If you would like to become a member of this organization, click here. On Wednesday, I visited Hamden Middle School with Rep. Robyn Porter (New Haven, Hamden) to talk with teachers and students who participated in the school's new Navigator Program. 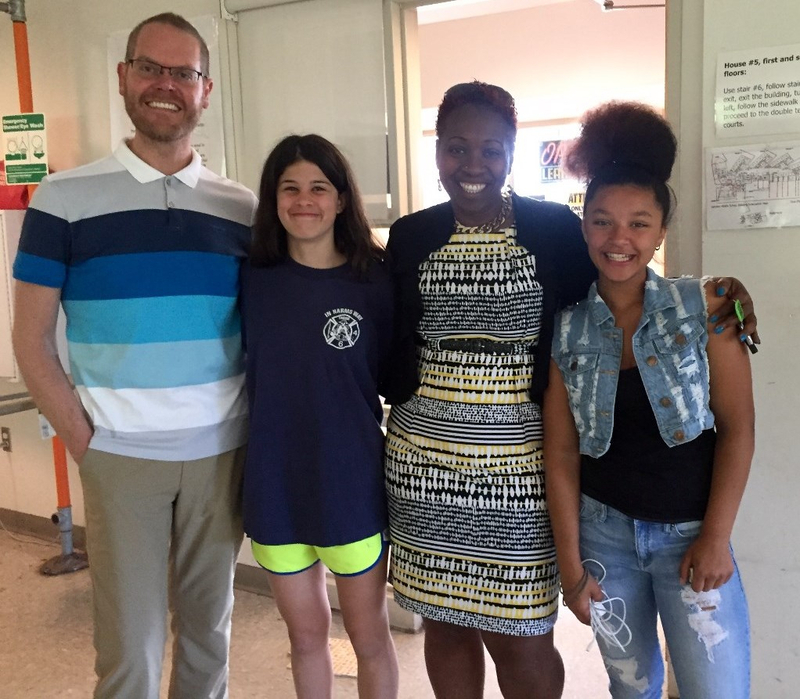 This program is an 8th grade project based learning team that aims to help students who traditionally haven't been successful with the norms of behavior, academics or attendance in regular education program. While utilizing the same common core grade level skills, the program's curriculum is designed to focus around the hands-on project, in this year's case, a sail boat made completely from scratch. In addition, the teachers piloted uses of Restorative Justice Behavioral practices, which asks that students learn how to restore their wrong doings to students, staff, and the school community, rather than receive a traditional form of discipline. The program had huge successes this year and will continue at both the 7th and 8th grade level next year! To learn more about this program, visit the thenavigatorproject.com or email Andrew Marzano at amarzano@hamden.org or Rob Mandel at RMandel@hamden.org to donate. Rep. Porter and I with Hamden Middle School students. Wednesday evening, I attended the South Windsor High School graduation at UConn's Jorgensen Center. I would like to thank Superintendent Dr. Kate Carter for her remarks reminding us all of the importance for kindness and gratitude for one another. Great speeches, endless accomplishments and familial support filled the theater. Congratulations to all these graduates and their families! 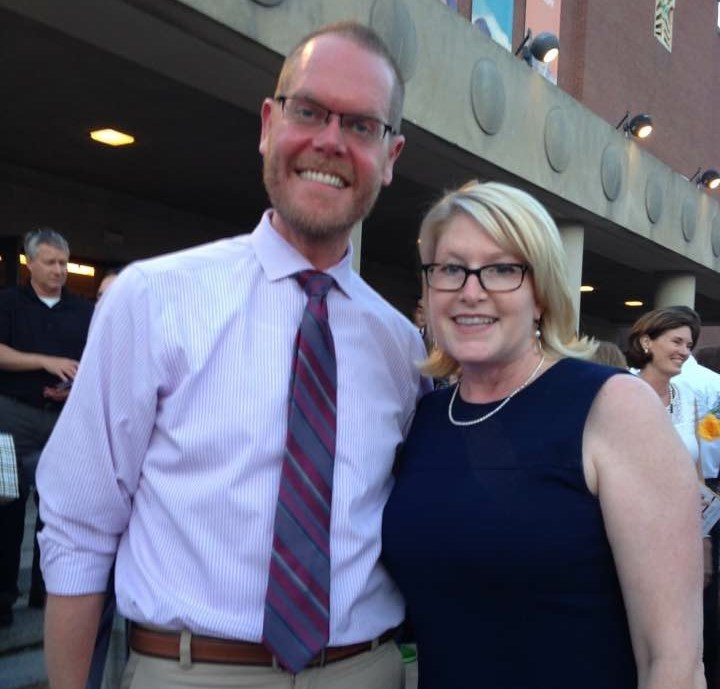 Here I stand with South Windsor Superintendent Dr. Kate Carter after the graduation. 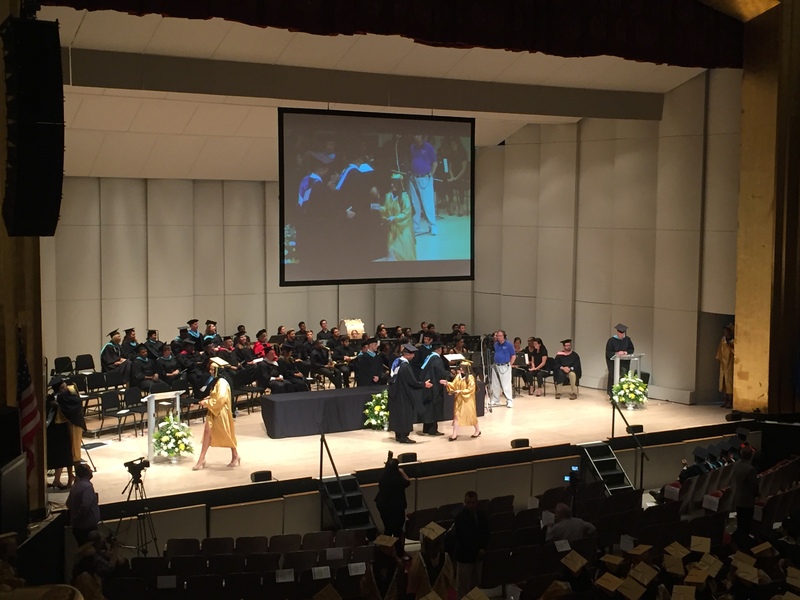 Although I was unable to attend the Manchester High School graduation, I would like to give my best wishes to all of the graduates. Congratulations Superintendent Matt Geary for organizing a successful event and congratulations to the 374 graduates on a job well done! I can't wait to hear about all your future successes! To read more about the Manchester graduation, read this Hartford Courant article. On Sunday, June 19, all outdoor pools are open for the summer season. Click here for the entire summer swimming schedule. Swimming is free for all residents. Tomorrow, Saturday June 18, is South Windsor Cares Day, a day which was organized by Boy Scout Jonathan Gordon to help senior residents clean their yards from 8 a.m. to noon. To volunteer to help with his Eagle Scout project, click here or email Jonathan. All those who wish to volunteer should meet at the Community Center located at 150 Nevers Road. A giant 3-day tag sale will benefit the Manchester Land Conservation Trust and its work to preserve open space lands. Tag sale dates are June 17, 18, 19 (Friday and Saturday 8:00 a.m. to 4:00 p.m., Sunday 8:00 a.m. to 2:00 p.m.) Come shop indoors at 330 Bush Hill Road in the old cider barn on our farm property, with 10,000 square feet of books, tools, artwork, curiosities, furniture, household and sports items, near-antiques, glassware, and items both useful and decorative. Connecticut's Senator Chris Murphy stood on the U.S. Senate floor for 15 hours until Republican lawmakers agreed to hold a vote on strengthening gun safety legislation. Under Senate rules, as long as he stood standing — and didn't try to nap or take a bathroom break — Murphy could keep talking. Thank you Sen. Murphy for showing strong leadership on a common sense measure. To read more about Murphy's marathon filibuster, click here. Two Colchester Connecticut residents have taken on an important job in their retirement. Avis Hull and Barbara Close voluntarily train dogs for Guiding Eyes for the Blind, a nonprofit that provides guide dogs to visually impaired men and women at no cost. After the dogs spend more than a year with the volunteers — including obedience classes with other dogs that are in the program — they go back to Guiding Eyes for a few more months of final training before they are paired with an owner. To read more about the efforts of Hull and Close, click here. Spending Cap Commission Meeting, LOB 1E, 1p.m. Commission on Health Equity Meeting, LOB 1C, 9:30 a.m. Safe Haven's Working Group, LOB 1C, 2:30 p.m.
French Canadian Flag Raising Ceremony, Capitol Gardens, 8:30 a.m.